Engine operation under improper temperature conditions (overheating or temperature lower than the regular one), as well as slow warming-up can indicate unstable operation of the cooling system. One of the reasons for unstable operation of the cooling system is malfunctioning radiator, and internal (dirt, soot in the radiator core or tank) and/or external (dust, poplar seed tufts, leaves etc.) contaminations. Internal contaminations result in less efficient fluid circulation or its stop. 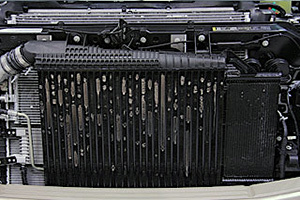 A characteristic symptom of contamination: the radiator is only warm in its upper part, and the lower part stays cold. External contaminations reduce the efficiency of cooling by counter flow of air or by an air flow from the fan. To eliminate the malfunction you need to thoroughly flush the radiator. To clean external contaminations, use VERYLUBE Engine compartment cleaner. Insufficient quantity of the coolant in the cooling system occurring due to the unpressurized cooling system, leaky connection hoses, gaskets, radiator core and tanks, as well as tension release or fan drive or pump belt slip leads to the engine overheating. 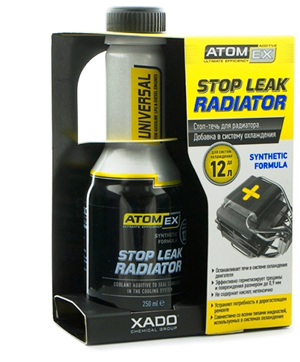 To eliminate cracks and defects up to 0.9 mm in diameter, use Stop Leak Radiator. If the defects are larger, the defective parts need to be changed. To increase the service life, reduce wear and eliminate slippage of fan or pump drive belts, use VERYLUBE Belt reconditioner. The operational stability of the cooling system can also be influenced by condition of the thermostat, fan operation sensor and hermetically sealed reservoir tank. If you find some malfunctions in these mechanisms, replace them.